, an eminent prelate a ntt statesman, in the reign of Henry VII. was the eldest son of Richard Morton, of Milbourtie St. Andrew’s in Dorsetshire, and was born in 1410 at Bere in that county. The first part of his education he received among the monks of Cerne abbey, and thence removed to Baliol college, Oxford, where in 1446 he was one of the commissaries of that university, and had been also moderator of the civil law school, and principal of Peckwater inn in 1453. In 1458 he was collated to the prebend of Fordington with Writhlington in the cathedral of Salisbury, which he resigned in 1476. In the same year he was installed prebendary of Covingham in the church of Lincoln, and on this occasion. resigned the sub-deanery to which he had been collated in 1450. In October 1472 he was collated by archbishop Bouchier to the rectory of St. Dunstan’s in the East, London, which he held only two years; and the same month was collated to the prebend of Isledon in the church of St. Paul, which he exchanged in the following year for that of Chiswick in the same church. In 1473 he was appointed master of the rolls, and in 1474 archdeacon of Winchester; in both which offices he was succeeded by his nephew Robert Morton, afterwards bishop of Worcester. In May of the same year, 1474, he | was collated to the archdeaconry of Chester, and not to that of Chichester, as Browne Willis has inadvertently said. In March 1475 he was installed by proxy archdeacon of Huntingdon; and the same year collated to the prebend of St. Decuman in the cathedral of Weils. In April 1476 he was installed prebendary of South Newbald in the metropolitan church of York, which he resigned the same year, in which he was also further promoted to the archdeaconry of Berkshire; and in January 1477 to that of Leicester. This list of promotions, in various quarters of the kingdom, and from various patrons, may serve to shevr the high esteem in which he was held. His eminent abilities, as a civilian, during his practice as an advocate in the Court of Arches, recommended him to the notice of cardinal Bourchier, who, besides conferring many of the above preferments on him, introduced him to Henry VI. who made him one of his privy council. To this unfortunate prince he adhered with so much fidelity, while others deserted him, that even his successor Edward IV. could not but admire and reward his attachment; took him into his council, and was much guided by his advice. He also, ' in the same year, 1478, made him both bishop of Ely and lord chancellor of England; and at his death appointed him one of his executors. On this account, however, he was considered in no very favourable light by the protector, afterwards Richard III. who had no hopes of alluring him to his interests. When bishop Morton and others were assembled in the Tower on June 13, 1483, to consult about the coronation of Edward V. the protector came among them, and after some general discourse turned to the bishop of Ely, and said, “My lord, you have very good strawberries in your garden at Holborn, I require you let me have a mess of them.” “Gladly, my lord,” the bishop answered; “I wish I had some better thing as ready to your pleasure as that.” Yet, notwithstanding this apparent civility, Morton, with archbishop Rotheram, lord Stanley, and others, were the same day taken into custody, as known enemies to the measures then in agitation. 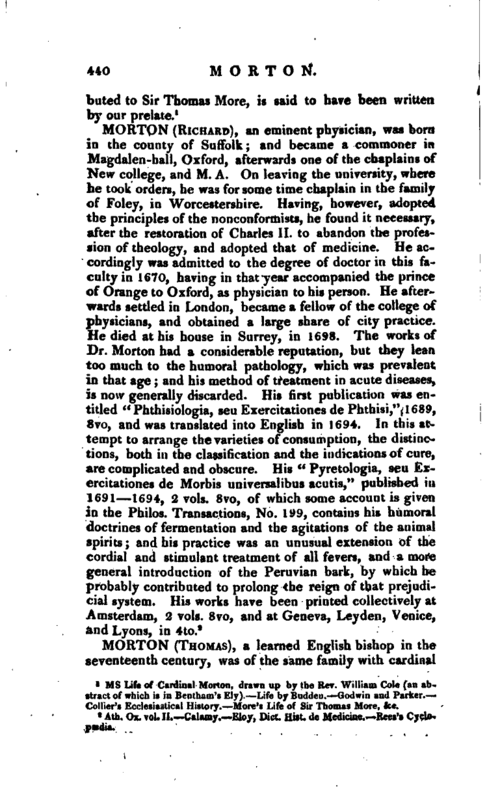 As soon as this was known, the university of Oxford, to which Morton had been a benefactor, sent a petition in Latin to Richard, pleading for his liberty; whether with effect does not appear; but it is certain that for this or some other reason he was soon released from prison, and given in ward to the duke of Buckingham, then | a warm partizan of Richard, but completely brought over to the other side by conversation with the bishop. He was sent to th.e duke’s castle at Brecknock, whence he escaped to the isle of Ely, and soon after, disguising himself, went to the Continent to Henry earl of Richmond; and it was agreed among the friends of the late king’s family and the well-wishers to the peace and harmony of the kingdom, that king Edward’s eldest daughter, Elizabeth, should be pnited to Henry by marriage; and thus, by joining the interests of the white and red rose in one, a coalition might be formed between the jarring parties of York and Lancaster. All this is said to have been the plan recommended by Morton, and he lived to see it happily accomplished. It is indeed that transactiou of his life which gives him a very honourable place in English history. Horace Walpole only, in his “Historic Doubts,” has obliquely accused him. of violating his allegiance to Richard III. ; but to Richard III. no allegiance was either due, or paid. 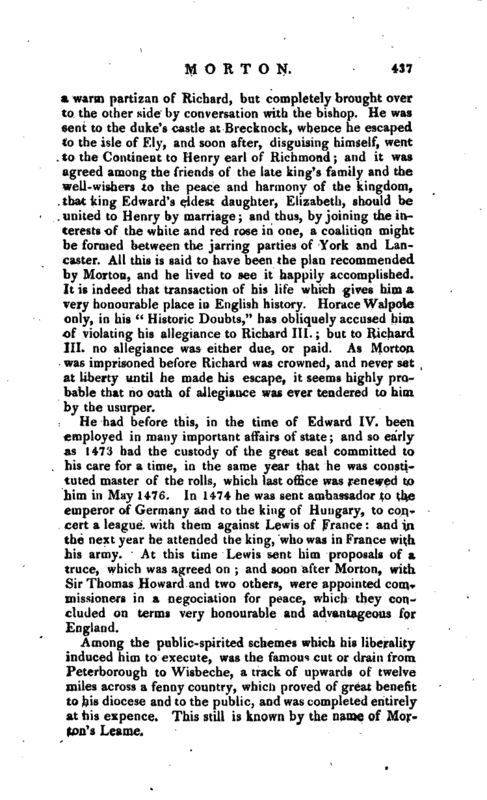 As Morton was imprisoned before Richard was crowned, and never set at liberty until he made his escape, it seems highly probable that no oath of allegiance was ever tendered to him. by the usurper. He had before this, in the time of Edward IV. been employed in many important affairs of state; and so early as 1473 had the custody of the great seal committed to his care for a time, in the same year that he was constituted master of the rolls, which last office was renewed to him in May 1476. In 1474 he was sent ambassador to the emperor of Germany and to the king of Hungary, to concert a league with them against Lewis of France: and in, the next year he attended the king, who was in France with his army. At this time Lewis sent him proposals of a truce, which was agreed on; and soon after Morton, with Sir Thomas Howard and two others, were appointed commissioners in a negociation for peace, which they concluded on terms very honourable and advantageous for England. Among the public-spirited schemes which his liberality induced him to execute, was the famous cut or drain from Peterborough to Wisbeche, a track of upwards of twelve miles across a fenny country, which proved of great benefit to his diocese and to the public, and was completed entirely at his expence. This still is known by the name of Morton’s Leame, | As soon as Henry VII. was seated on the throne, after the death of Richard III. he sent for Morton, who was still abroad, and immediately on his arrival made him one of his privy council; and on the death of cardinal Bourchier, in 1486, he was, probably on the king’s recommendation, elected by the prior and convent of Canterbury to be archbishop. In the mean time the king granted him. the whole profits of the see, until the pope’s confirmation could be obtained, and the disposal of all the preferments annexed to it; and having received the pope’s bull, dated Oct. 6, 1436, he was, by the king, admitted to the temporalities on Dec. 6 following In August 1487 he was constituted lord chancellor of England, which office he retained to his death. In a ms. in the British Museum, (Mss. Harl. 6100. fol. 54.) he is said to have been made chancellor in 1485, which was the first year of Henry VII. ; and we have already mentioned, from another authority, that he filled that office while bishop of Ely. In 1493 he was creiited a cardinal by pope Alexander VI. by the title of St. Anastasia. In Hall’s Chronicle this promotion is placed in 1489, which is a mistake. 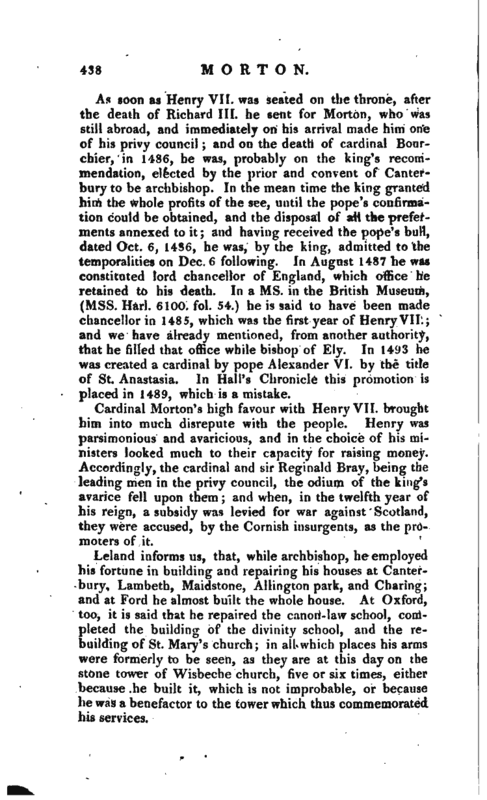 Cardinal Morton’s high favour with Henry VII. brought him into much disrepute with the people. Henry was parsimonious and avaricious, and in the choice of his ministers looked much to their capacity for raising money. 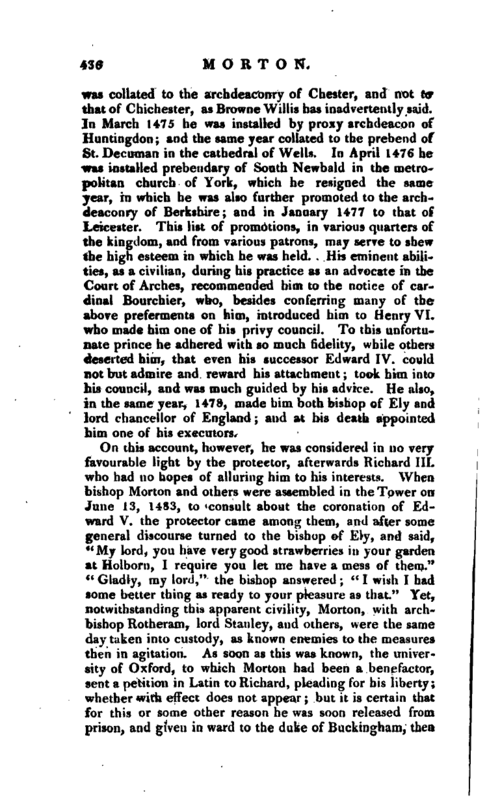 Accordingly, the cardinal and sir Reginald Bray, being the leading men in the privy council, the odium of the king’s avarice fell upon them; and when, in the twelfth year of his reign, a subsidy was levied for war against Scotland, they were accused, by the Cornish insurgents, as the promoters of it. Leland informs us, that, while archbishop, he employed his fortune in building and repairing his houses at Canterbury, Lambeth, Maidstone, Allington park, and Charing; and at Ford he almost built the whole house. At Oxford, too, it is said that he repaired the canon- law school, completed the building of the divinity school, and the rebuilding of St. Mary’s church; in all which places his arms were formerly to be seen, as they are at this day on the stone tower of Wisbeche church, five or six times, either because he built it, which is not improbable, or because he was a benefactor to the tower which thus commemorated his services. | In February 1494 he was elected chancellor of the university of Oxford; in which year Fuller says he greatly promoted the re-building of Rochester bridge. One of the last acts of his life was to procure the canonization of Anselm archbishop of Canterbury; and he also endeavoured, but without effect, to procure the same honour for his old master Henry VI. 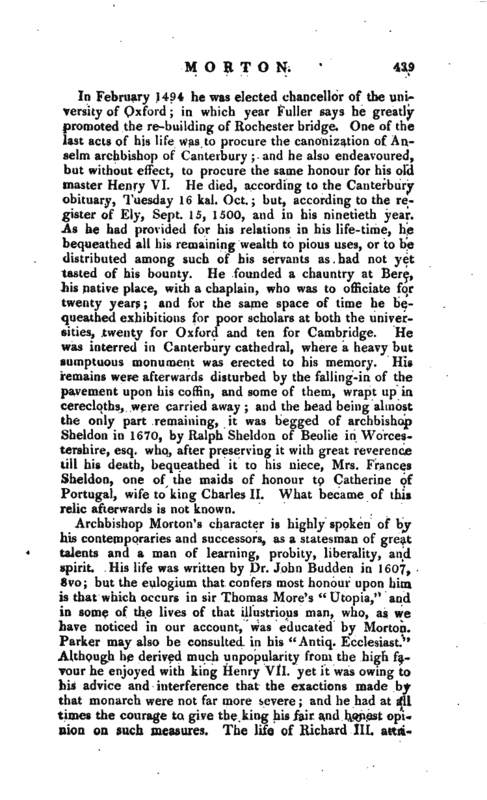 He died, according to the Canterbury obituary, Tuesday 16 kal. Oct.; but, according to the register of Ely, Sept. 15, 1500, and in his ninetieth year. As he had provided for his relations in his life-time, he bequeathed all his remaining wealth to pious uses, or to be distributed among such of his servants as had not yet tasted of his bounty. He founded a chauntry at Bere, his native place, with a chaplain, who was to officiate for twenty years; and for th’e same space of time he bequeathed exhibitions for poor scholars at both the universities, twenty for Oxford and ten for Cambridge. He was interred in Canterbury cathedral, where a heavy but sumptuous monument was erected to his memory. His remains were afterwards disturbed by the falling-in of the pavement upon his coffin, and some of them, wrapt up in cerecloths, were carried away; and the head being almost the only part remaining, it was begged of archbishop Sheldon in 1670, by Ralph Sheldon of Beolie in Worcestershire, esq. who, after preserving it with great reverence till his death, bequeathed it to his niece, Mrs. France* Sheldon, one of the maids of honour to Catherine of Portugal, wife to king Charles II. What became of this relic afterwards is not known. 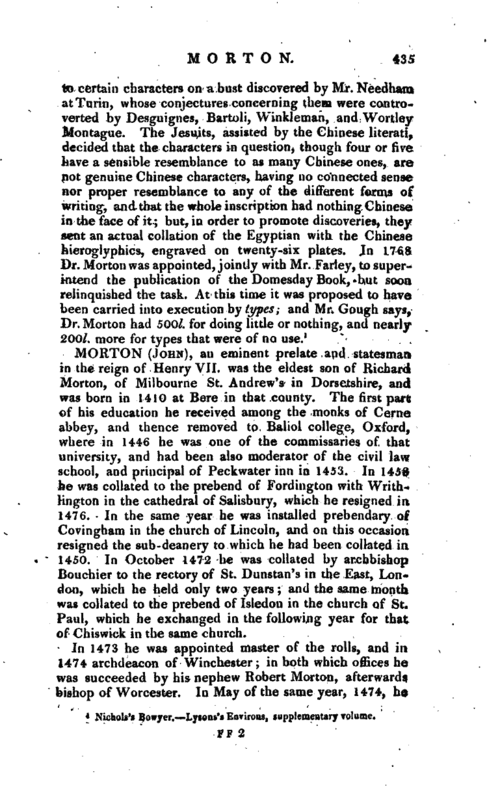 ms Life of Cardinal Morton, drawn up by the Rev. William Cole (an abstract of which is in Bentham’s Ely) Life by Budden. Godwin and Parker. Collier’s Ecclesiastical History. More’s Life of Sir Thomas More, &c.